Lithium won't have any meaningful impact on Australia's mineral exports until after the mid-2020's, according to the Department of Industry, Innovation and Science. When compared to iron ore exports of $74 billion lithium is still a minnow and markets have been sliding for nearly 18 months. ASX listed lithium-exposed miners like Altura, Pilbara Minerals and Kidman Resources have all been steadily falling since January 2018. Altura (ASX: AJM) hit a high of 48 cents in January 2018 but by the end of March had slid to 14 cents. Pilbara Minerals (ASX: PLS) was trading at $1.20 in January 2018 and had fallen to 79 cents at the end of March. Companies are feeling the optimism however. China has provided its final 2019 new energy vehicle subsidy policy. A reduction in total subsidies amounts to -65-70% with central government subsidies reduced by -40-60% depending on type. Local government subsidies will be completely removed after a transition period. Citi suspects this may pull forward the demand for electric vehicle batteries and lithium to the first half and, subsequently, it is possible there will be a decline in the second half. This does not change Citi's long-term forecasts for 11% penetration of battery electric vehicles and plug-in hybrid electric vehicles by 2025. However, the trajectory may be different. The policy has a transition period from March to June 2019 which could buffer the negative impact over the full year, as incentives are increased for front-loading sales during this time frame. Nevertheless, the broker acknowledges these reductions in subsidies are the most significant there has been over the past few years so the impact on demand in the second half remains uncertain. From the detail, Citi ascertains the subsidy for pure battery electric cars driving over 400km will be reduced by -50% to around US$3700 per vehicle. Battery electric vehicles with a range of less than 250km will no longer receive any subsidy, which is in line with expectations. Plug-in electric vehicles subsidies are reduced by -55%. Meanwhile the battery density multiplier is capped at 1.0x for all batteries with density over 160Wh/kilogram. Citi suspects this will slow the industry's rush towards 811 batteries. Morgan Stanley considers the reduction in subsidies negative for both lithium prices and related equities and suggests consensus expectations of EV penetration rates for China could be overly optimistic. The broker expects the production surplus of lithium over 2019 to begin to incorporate the price normalisation process, including a convergence of spot and contractual prices. The failures of the former Big 3 helped speed the growth of Ganfeng and Tianqi and created opportunities “Down Under” which leads me to a “blunder in progress”. Emerging Blunder #4, comes from the ‘Merry Old Land of Oz”. I am a big a fan of Australia. Friendly, hard working people, great food and a long standing mining culture. Unfortunately, Australia's strength in mining also drives their weakness in how they think about lithium. Too many Aussies talk about “lithium mining”. 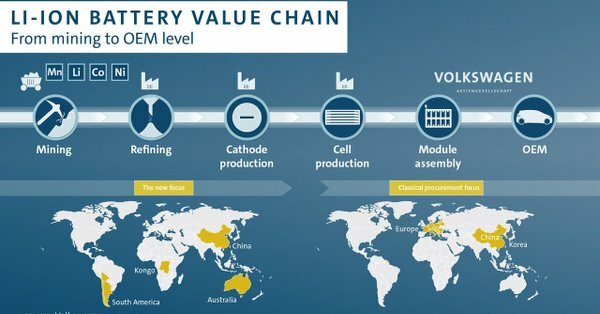 Yes, lithium is mined in Oz but that is the easy part. The alpha but certainly not the omega. The rest of the world clearly understands that lithium is really a chemical business with, in some cases, a mining component. Australia and many newly minted lithium pundits born and bred in Oz talk about Western Australia as the #1 lithium producer on the planet. To those who think that is true, let me ask – if you are #1, why aren't you currently in the top 3 in lithium value capture? I will leave my Aussie readers to curse me on Hot Copper while they search their souls for the answer or re-read the “The Lithium Valley”- LOL. Please listen to Episode 23 of the Global Lithium Podcast where one of your own talks common sense about capturing value downstream. I admire what “the man from the land down under” aka Ken Brinsden has done at Pilbara. He understands the future and has a practical plan to get there as Pilbara grows. He knows that the future lies in Australian companies capturing value from both mining and lithium chemical production. A review of regulatory filings, court documents and interviews with Codelco officials shows the strategy was deeply troubled from the start. Dwindling support inside Codelco to prioritize lithium projects over copper, company insiders said, was compounded by legal and regulatory hurdles that stalled development of the company’s two flagship salt flats known as Pedernales and Maricunga. As a result, Codelco has yet to find a partner for either project years into the initiative to boost output of the metal. Global automakers, meanwhile, are planning a $300 billion surge in spending on electric vehicle technology, including the vital battery technology, over the next five to 10 years. Codelco's projects, once thought a shoo-in to boost global supply and lower prices, have largely fallen off forecasts, and Chile has ceded its position as the world's top producer of lithium to Australia. Canada’s North American Lithium has halted lithium spodumene production temporarily because of the fall of $200 per tonne in prices for the commodity in the Chinese spot market over the second half of 2018. Canada-based North American Lithium has halted production of lithium spodumene at its La Corne mining operation in Quebec, eastern Canada, because of the lower spodumene prices in China, the company announced on Wednesday February 20.